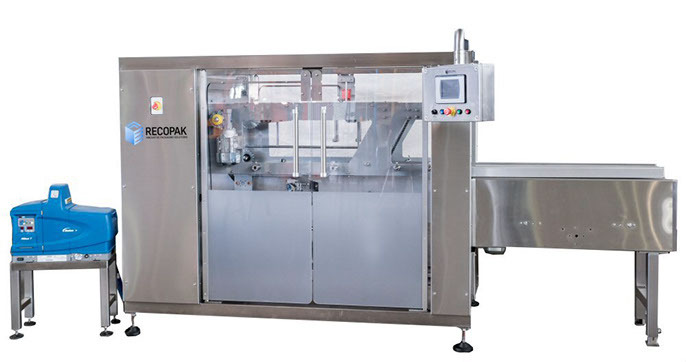 The Recopak Multipacker is a combination Basket Packer and Neck through Wrap Packer with Hot Melt glued base is unique to the market. This semi automatic machine is capable of handling both baskets and wraps with speeds of upto 30 packs per minute. Straight through operation for loose product is at the touch of a button. NO external bypass conveyors are necessary. Recopak offer a complete solution to your Multi Pack requirements based on your product needs and marketing goals. Every machine built on our factory floor is thoroughly tested and undergoes real work conditions to ensure you smooth turnkey operation. Full size guard doors offer complete access for operator intervention.